Hunton is a small, surprisingly plain village compared with the picturesque villages nearby and the very beautiful surrounding countryside of Wensleydale and Swaledale in north Yorkshire. These two dales, together with several others, comprise the area often known as Richmondshire. Only six miles from Hunton is the very lovely and historic town of Richmond, 'Gateway to the Dales', with its cobbled market place and ancient 'wynds' which join the old town to elegant Georgian thoroughfares and lovely gardens. There are magnificent views from the town's lofty castle tower. Richmond's Georgian Theatre Royal is unique: the oldest theatre in the UK surviving in its original form, and the nearby Richmondshire Museum is well worth a visit, too. Many famous people and events are asociated with the area. Swaledale and Wensleydale provided the subjects for some of the finest watercolours by the famous English painter J M W Turner (1775-1851), who made four tours through Richmondshire, in 1797, 1816, 1817 and 1831. In 1816 during a three week tour through northern England, he made over 400 drawings of the area's towns, villages, abbeys, rivers, waterfalls and castles. A series of seats has now been placed throughout Richmondshire at some of the places associated with Turner. The nearest to Hunton is probably the one at Constable Burton. Lewis Carroll (author of Alice in Wonderland) went to school at Swale House, Richmond; Cherry and Richard Kearton, the famous naturalists, grew up at Thwaite and went to school in Muker. Francis l'Anson (Lass of Richmond Hill) lived at Hill House, Richmond. Many of the scenes from the films of the famous vet James Herriot were shot in Wensleydale, though none, as far as we know, near Hunton. Hunton itself is a long straggling village forming a letter 'Y' and consists mainly of rows of houses on both sides of three roads, and two offshoot lanes with houses along their length. Several little streams meet and run through the village, and there is even a ford. 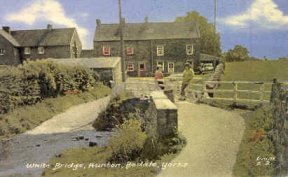 The village probably took its name from the Hunton family, long associated with the area: in the reign of King John (1199-1216), a Roger de Hunton was one of the witnesses to a grant of land to the nuns of Marrick, Yorkshire. There used to be a small church, St Johns, rebuilt in 1794 by Gregory Eisley, Esq, and also a Wesleyan chapel, built in 1829. However, as far as we know, the Dumvilles of Hunton went to the larger church of St Patrick at nearby Patrick Brompton for their baptisms, burials, and some marriages. Robert's youngest daughter Elizabeth (1830-1907) married Robert Lawson, and Hunton's 1851 census shows the couple living next-door to her elderly father, his second wife Elizabeth, their 26 year old son James and four year old grandson Robert. With Robert and Elizabeth Lawson is their three month old daughter Elizabeth. Robert Lawson later became a grocer and shopkeeper in Hunton. Bulmer's 'History and Directory of North Yorkshire' for 1890 lists several grocers and other businesses in Hunton; I believe the only shop now (2003) is a post office/general village store. Just down the road from Hunton is Constable Burton Park, with its magnificent Hall, an estate of over 2,500 acres. A 1771 map (Jeffery's survey) shows a large part of the estate is fenced off as a 'foal park' belonging to Marmaduke Wyvil. And many other places near Hunton have long been associated with horse-breeding, training and racing. Plenty of work for good molecatchers here! We would be very interested to learn more about Hunton and its history. Probably the only grave at Patrick Brompton is the one for Susan Dumville (née Johnson) (1864/65-1889), wife of George Dumville (b 1861). There are others in the area which are directly related to Geoff Brown's family. Thomas (1807-1893) and Mary (1805-1886) Dumville are buried at Healey, near Masham. Their gravestone is not in good condition. James (1856-1920) and Elizabeth (1854-1928) Dumville are buried at Well, near Bedale. Their gravestone is in good condition. Some memorials to Dumvilles in Snape and Well are mentioned in James Dumville (1856-1920): Biography.